I know that preparing for Christmas (including the decoration of the house) can be nothing but a big ball of stress for some of us. To help you get inspiration, I’ll offer you a whole new color palette to play with this year. 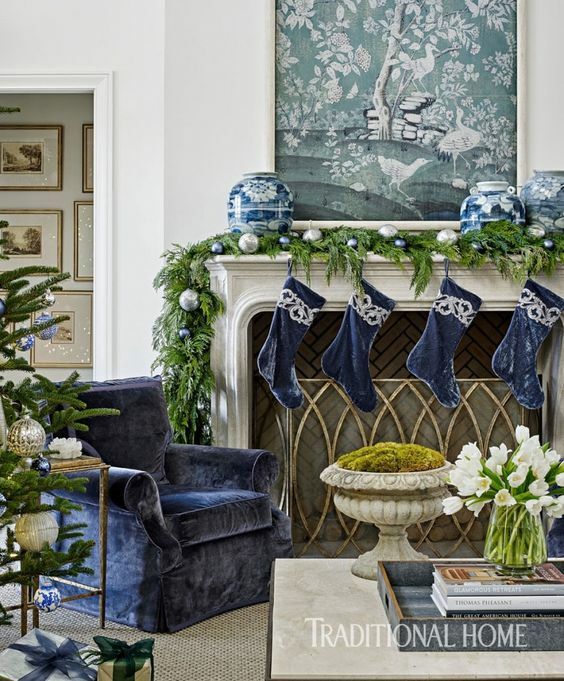 The navy blue Christmas decoration gives the house a chic vintage vibe without looking too understated and old-fashioned. Still, don’t believe me? Are you afraid of ditching the classic red-green color palette? Here is an idea that would be from a great help for someone who will host a Christmas dinner party this year. The whole setup looks so understated and yet insanely elegant and eye-catching. 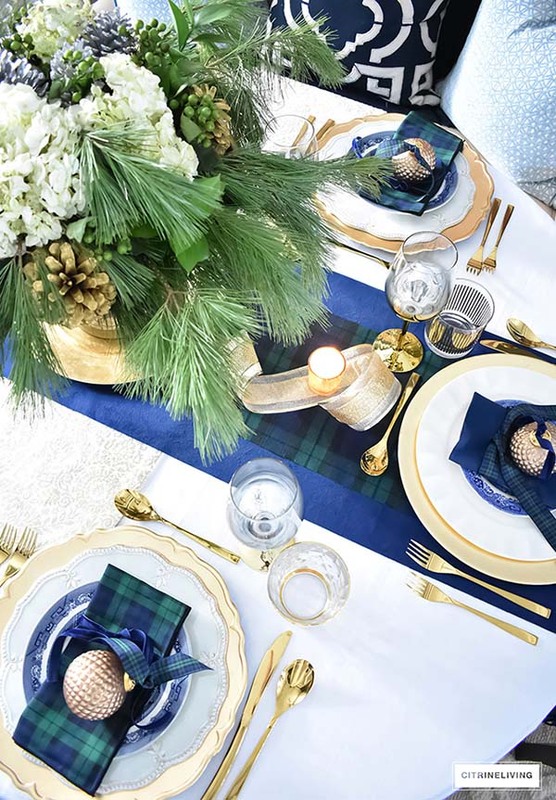 The tartan touches injected in this tablescape complement the luxurious golden cutlery set. 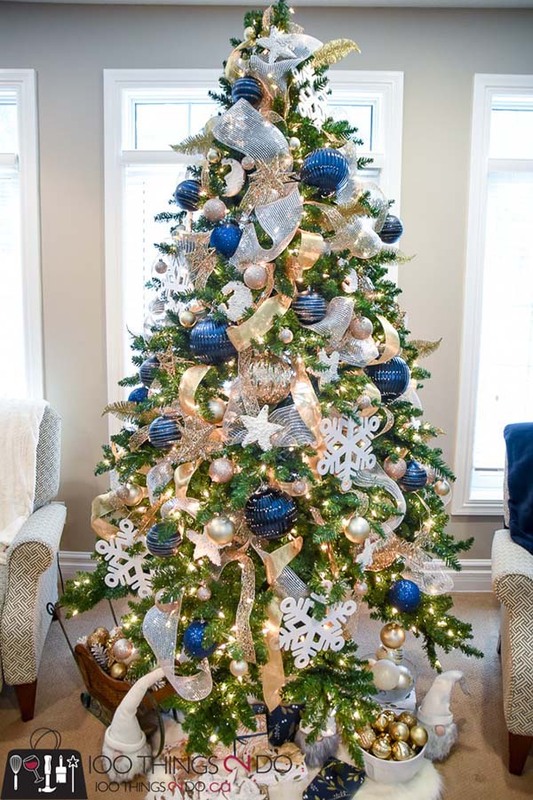 What if, this year, instead of sticking to the classic red-green color palette, go for a navy blue and gold Christmas tree decoration for a sophisticated living room space. The string lights make the artificial golden tree look even more glamorous. Hard to resist, eh? 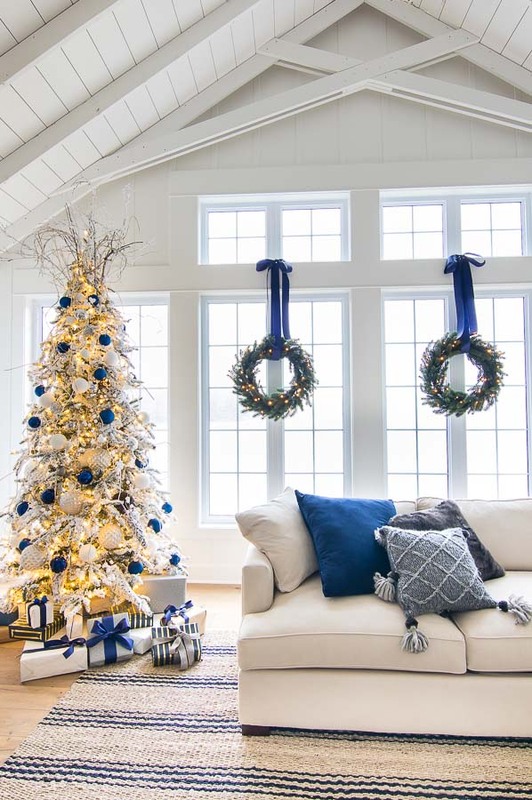 In case you want to re-create this expensive-looking navy blue Christmas decoration, make sure your living room is spacious enough. I simply love how sparkly and cheerful these golden elements look on the low-key navy blue background. Add some Christmassy elegance to your home this holiday season while displaying your faith! 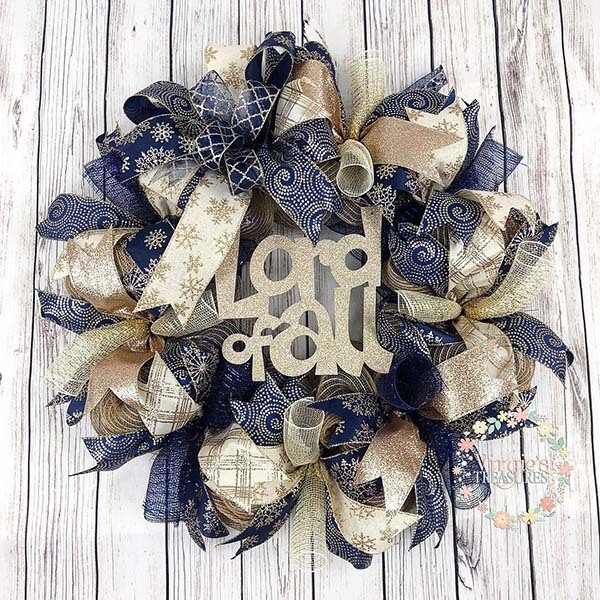 This insanely gorgeous wreath is made of premium cream ivory decorative mesh and premium shimmery ribbons in different patterns of navy and gold. 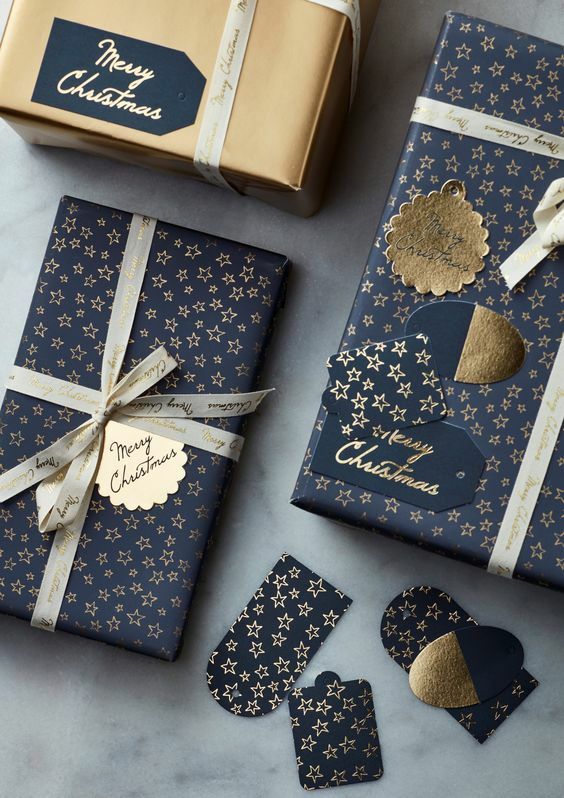 Speaking of navy blue Christmas decoration, wrapping the holiday presents for your friends and family in this color theme will look stylish and unique. Set your creativity free and pick up some delicate golden ribbon, golden name tags etc. 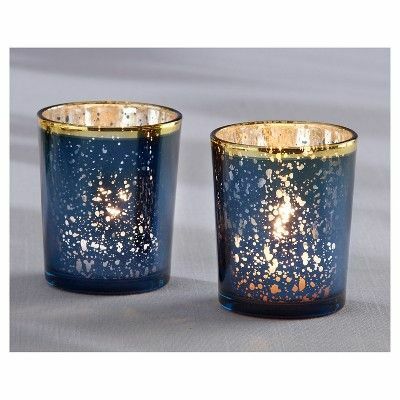 This pair of navy blue and gold mercury glass tea light candleholders is something that you might need if you’re officially done with the themed Christmas decoration but still have the feeling something is missing. 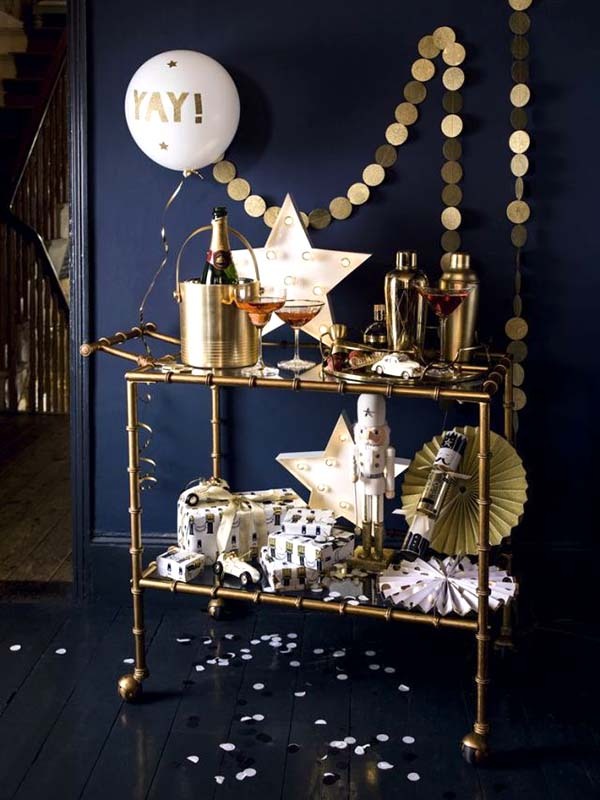 They are very unpretentious and will add sparkle to the living room space. Besides, I like the idea of having a piece of furniture and a bunch of holiday stockings made of the same material and color. 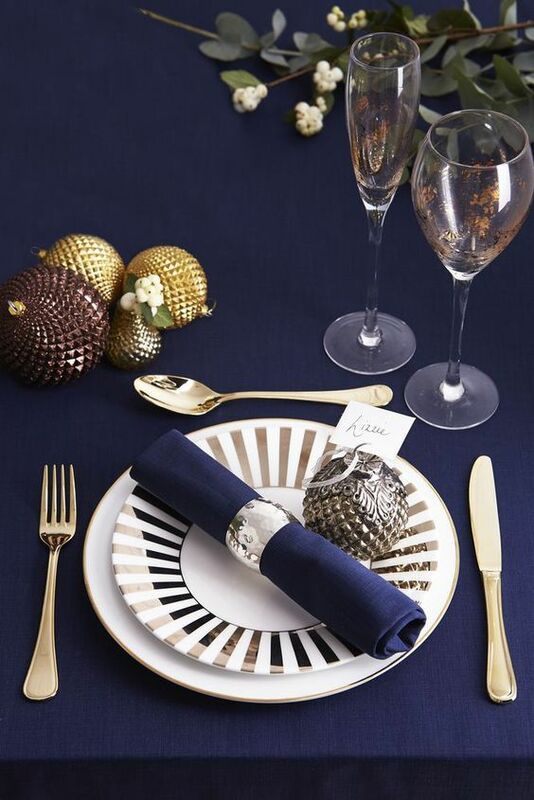 Blending navy blue napkins with gold cutlery is an elegant addition to every gold and blue Christmas decorations. It is simple and yet very stylish and classy. Idea: Add some Christmas tree ornaments in gold for a finishing touch. 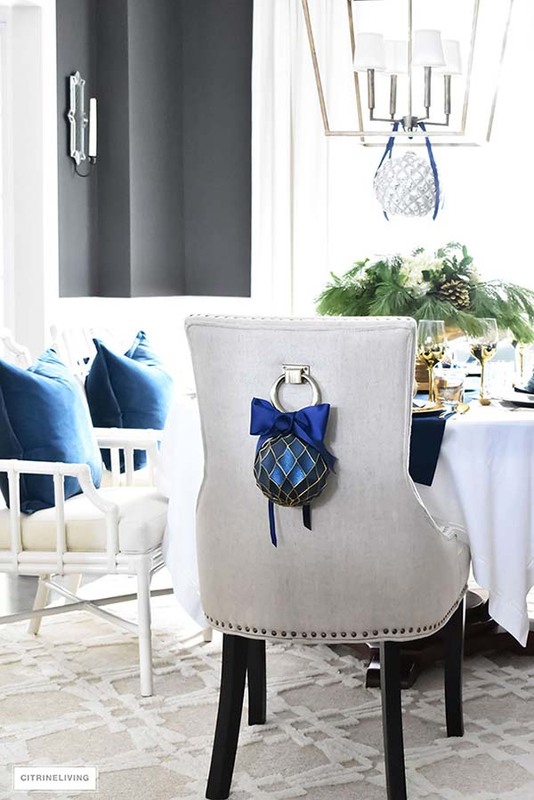 The showy beautiful Christmas ornaments in navy blue on the chairs complement the understated mercury glass ornament hanging from the chandelier. It’s always a cool festive touch to add something glimmery to a simple light fitting like this. Cuteness overload! 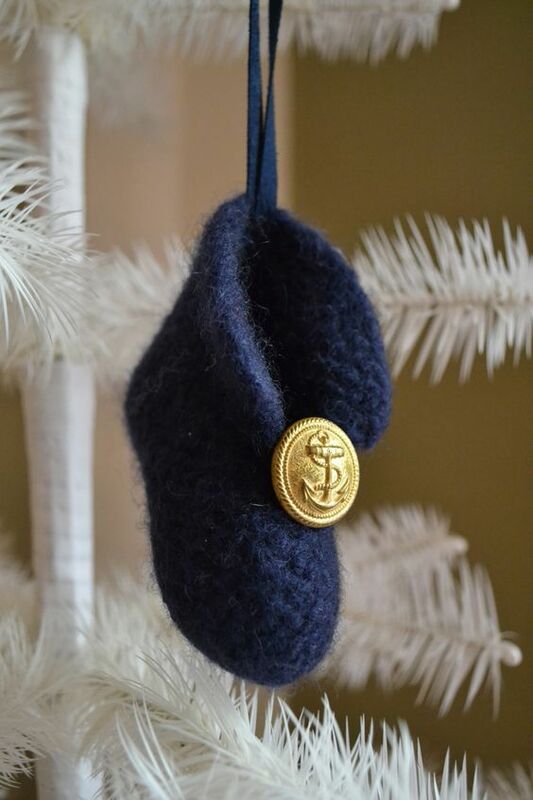 This knitted baby shoe Christmas tree ornament in navy blue with a chic golden accent is such a show-stopper! It’s like a symbol of the new life, the new-born baby boy (Christ), the new beginning, the happiness. I’ve always been a huge fan of the gold Christmas decorations as they are able to make such a strong statement. 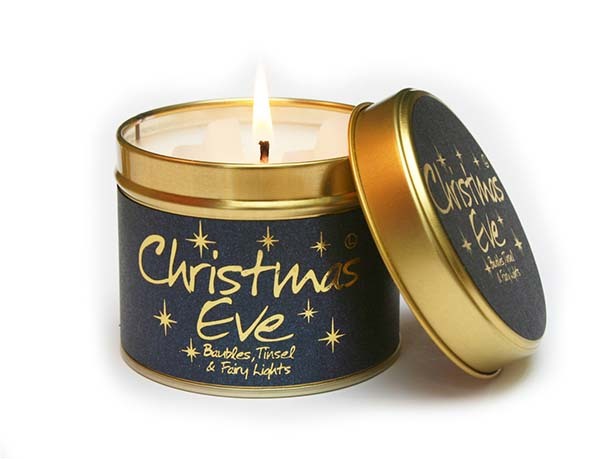 This Christmas Eve scented candle, for instance, is a sophisticated mixture of raw woodiness and glacial winter thrill. This beyond stunning Christmas centerpiece features almost every symbol of the holiday – shimmering golden tree ornaments, navy blue candles, wrapped gifts, starry garland. Great idea for tinny tiny flats with no much space for a snowy Christmas tree. 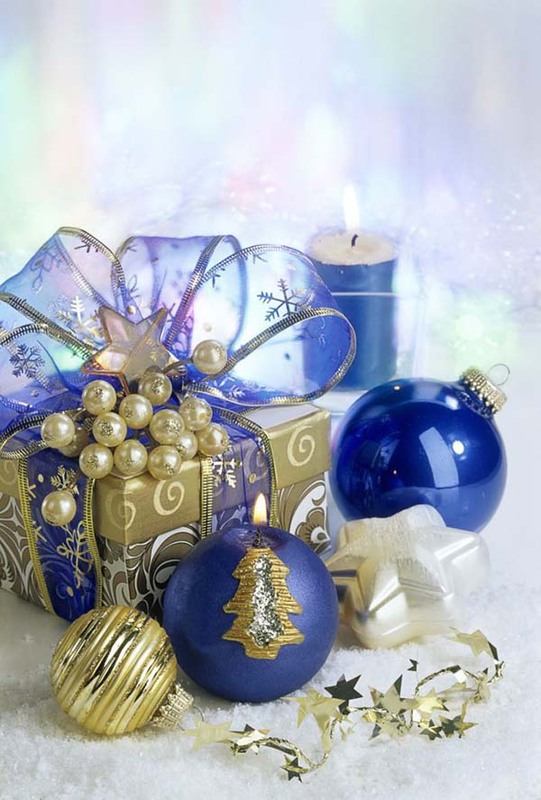 Fairy golden ribbon, navy blue ball ornaments….large snowflakes…what else would you Christmas tree need this year? Besides, make sure you customize this beautiful project in order to show the guests your own taste and style. The truth is, you should have them on your festive dining table! What is Christmas without a bunch of Christmas stockings hanging on the fireplace mantel? 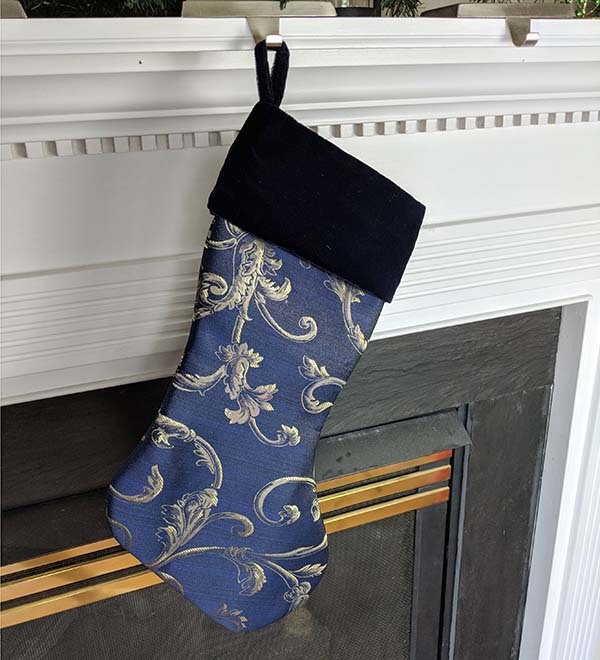 This one, for instance, is made of a navy blue and gold jacquard fabric on the outside with a delicate velvet cuff in the same color. 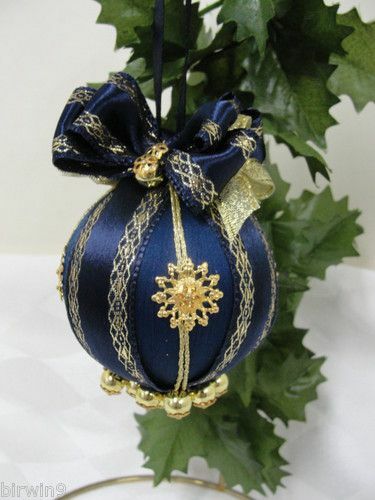 Displaying one of those decorative tree ball ornaments will surely add some extra festivity to your home this Christmas. The muted colors blend well with most of the holiday colors whilst the gold elements will glisten beneath the lights of your Christmas tree. 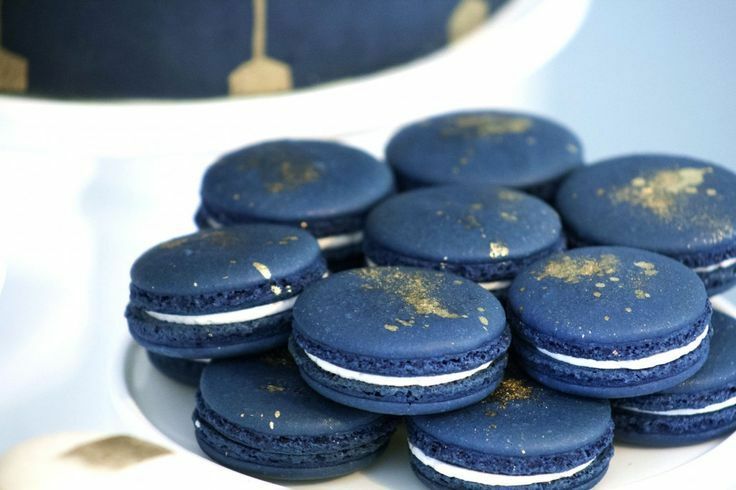 The best thing about the navy blue and gold decoration is that most of it can be used for wedding and stylish dinner parties as well. It is very different from the joyful classic red-green color palette, however, the combo of navy blue and gold is crazily stylish and refined.